We live in a beautiful but broken world. The Christian faith is the story of tragic ruin and glorious rescue. God made human beings to govern his world but we have marred his handiwork and spoiled ourselves. To undo our rebellion, God sent his Son, Jesus Christ, the world’s true King, to save us. Jesus lived the life we should have lived, died the death we deserved to die, and in rising again shattered the power of the grave. As followers of Jesus, we live in a new world order: we are sinful people delighting in forgiveness, and proud people learning to be humble. We obey Jesus as King and we treasure his words above all other voices. From buildings to ceremonies, everything has a shape—and every shape speaks. Cathedrals and castles speak of glory and greatness, of royalty and privilege; ballrooms are built to tell stories of music and dance; weddings dramatically enact the leaving of one family and the forming of another. 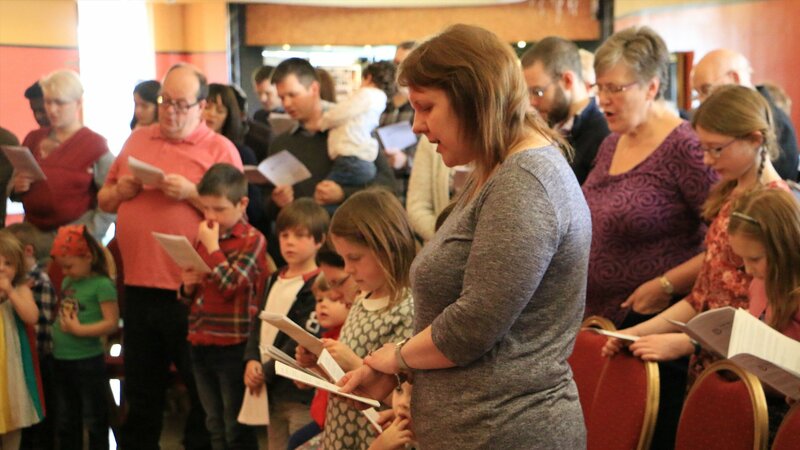 At Trinity, our Sunday worship is structured to tell the story of the good news about Jesus. Into darkness, God spoke and made a universe. Into a world of beauty and truth, human beings brought chaos and lies, but God did not abandon us to our ruin. Jesus came as the light and Saviour of the world and he calls all people everywhere to follow him. This grand story means our Sundays together begin with a call to worship, as the living God addresses us and calls us to adore him. We respond to him in song with reverence and awe, and with confession of our sins, as we see how great he is and how far short we fall of his glory. God speaks to assure us of his pardoning grace in Jesus, and we hear his living words in Scripture. At the heart of our services is attentive listening to what God has said in the Bible. As he speaks, so we respond again with our prayers, our gifts and offerings, and our praise. At the close of our service God sends us out into his world, renewed and restored, with his words of blessing. It’s easy to get lost in a crowd, and it’s hard to go it alone. Belonging to Jesus means we belong to each other and at Trinity we do our best to look out for one another. We are not a families church, but a church family—a group of people of all ages, sharing all of life together, joys and triumphs and sorrows and struggles.